This Aja-Kleen was modified for cleaning a large basket of brake components. The customer wanted to quickly and effectively remove machining oils and debris from a large basket of brake parts. The process required washing using directional turbulence to clean the parts. 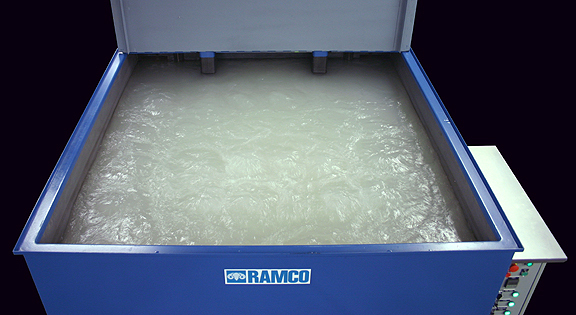 The basket was 60″L x 60″W x 27″H and the system was capable of loads well in excess of 2000 pounds. The construction is heavy gauge carbon steel. The tank rear wall is made of heavy gauge plate with exterior welded structural angles. Roller bearings mounted externally at critical locations to evenly distribute the load and eliminate all cylinder maintenance. The system used our standard oscillating elevator to transport the large basket of parts into and out of the chamber and to position and move the work within the washing zone. Using the normal up/down stroke of the elevator combined with a comprehensive turbulation system provided a very effective flushing action. Its is this function of the RAMCO system that allows it to achieve superior results – better coverage and accelerated processing times. 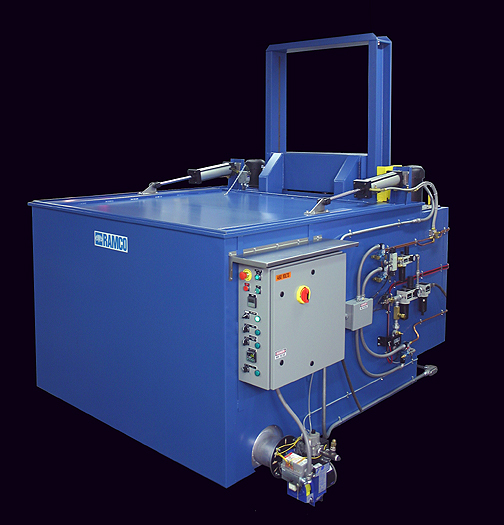 The system is gas heated using a serpentine immersion coil and a 350,000 BTU blast burner with electronic ignition. A Nema 12 panel with lockout-tagout disconnect, digital indicating temperature controller, automatic digital cycle timer and E-stop is provided. Solution turbulation is provided using two vertical immersion pumps located in rear recessed blisters. The pumps are connected to five bottom mounted closed looped manifolds using multiple solution jets directed within the chamber to provide uniform turbulence throughout the working zone.